Automotive Industry Standard 140 (AIS 140) is a set of standards published by ARAI (Automotive) for vehicle tracking system, camera surveillance system, and emergency request button. This mandate is in line with the Ministry of Road Transport and Highways notification dated 28th November 2016. To begin with, in order to comply with AIS 140 guidelines, every bus will need to have a NavIC/GPS tracking system, camera surveillance and an emergency button. This will help the concerned departments in tracking the bus in case of an emergency and also enable the passengers to apprise the control room of any kind of mishap or other emergencies. This AIS on Intelligent Transportation Systems (ITS) has been provisioned with both system level approval and vehicle level approval . System-level approval is needed to enable retro-fitment of ITS systems on in-use vehicles. This will ensure ITS backend infrastructure already present with the State Road Transport Undertakings (STUs) can be more fully utilized and make the investment in the backend infrastructure more viable. Both the existing vehicles as well as the future ones will be required to be fitted with GPS and emergency button. This implies that the automotive OEMs along with aftermarket companies and Tier 1 suppliers need to have these systems ready. 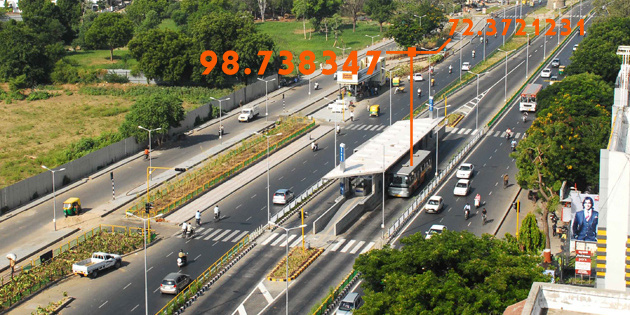 The Delhi Integrated Multi-Modal Transit System (DIMTS) document envisages that the hardware should be compliant with both GPS and IRNSS satellite systems . The final satellite of the IRNSS (renamed NavIC) system has been launched on 28th April 2016 and the NavIC system is expected to be operational soon. GPS and NavIC systems require entirely different hardware and software, both for the end user and for the operator. If in future India is likely to abandon GPS, it may be worthwhile to specify only NavIC compatibility in this standard. For wider adoption on and usage of NavIC, India’s own homegrown positioning system, the government is encouraging industry to innovate and come up with cost-effective chips and modules for the purpose. Moreover, the vehicle health monitoring system will seek the expertise of automotive embedded solution providers as CAN Stacks, OBD Stacks, and J1939 Stacks, further which have to be configured and integrated into the vehicles. There are concerns about cybersecurity, data ownership, and data security. To combat these issues, the Government of India has set up a high-level committee under retired Supreme Court Justice Shri BN Srikrishna. Some overseas member countries of the 1958 agreement have been continuously emphasizing in WP29 forums that the regulated ITS system must not encroach on privacy. According to Dr. Ajay Kumar, IAS, Addl. Secretary, Ministry of Electronics and Information Technology (MeitY), there is a need to create test infrastructure and the government is in the process of developing testing capabilities for IoT based devices in its Standardisation Testing and Quality Certification (STQC) labs . Towards this, the Automotive Industry Standards Committee (AISC) panel has submitted a document titled ‘Data Privacy in Transportation ITS’ To help the system developers deal with these issues. Further, the system developer can also take guidance from ‘IS/ISO/TR 12859: 2009 - Intelligent Transport Systems — System Architecture — Privacy Aspects in ITS Standards and Systems’  while developing their systems to meet the requirements of this standard. As per the direction of the Central Motor Vehicles Rules - Technical Standing Committee (CMVR-TSC) which needed the Communication Protocol and Backend Control Centre requirement for tracking and handling the alerts have been addressed in Section 6 & 7, of Finalized Draft- Automotive Industry Standard Intelligent Transportation Systems (ITS) - Requirements for Public Transport Vehicle Operation . The devices would transmit data to the Backend Control Centre using 2G/3G/4G wireless connectivity (with SMS fall back) as per the protocol provided in Section 6 . The data from the devices would travel over the wireless telecom service provider network and finally get delivered to the Backend Control Centre. The detail about Device to Backend Communication Mechanism is mentioned in Section 7 . The Vehicle Location Tracking (VLT) device would transmit data to the Backend Control Centre using GPRS wireless connectivity (with SMS fall back) as per the protocol provided in respective sections (Sub-section 6.3.4 ). The data from the devices would travel over the wireless telecom service provider network and finally get delivered to the Backend Control Centre. Since the permit holders/Device suppliers would require having a valid communication plan on SIM cards on the devices and would avail services from multiple telecom service providers, the data would be transmitted to the Backend Control Centre using the networks of multiple telecom service providers. A suitable control mechanism would be established for the data transfer from VLT to Backend Control Centre, as only the authorized devices should be able to transfer data to the Backend Control Centre and a mechanism for authenticating the devices/SIMs shall also be put into place. Registration and activation of the device(s) fitted on the vehicle, including the details of vehicle registration number, engine number, chassis number, vehicle make and model, device make and model, and telecom service provider’s name. Re-registration/re-activation of the device(s) fitted on the vehicle in case of any change in device or telecom service provider, etc. Regular health check of the device(s) fitted on the vehicle, as per the parameters and frequency defined in Sub-section 3.1.4 . Administration/configuration of devices for any changes in the parameters as decided by the respective state from time to time. Notification of alerts in case of a press of an Alert Button fitted on the vehicle, in the protocol defined in Section 4 . Notification of alerts in case of defined deviations by a vehicle such as over-speeding, deviation from defined route/geographic area, time of operation, etc. Notification to the permit-holder through SMS in case any device(s) stops functioning/sending data to the Backend Control Centre. Reports of the vehicles with devices not working/sending data beyond the defined number of days (1 day, 3 days, 7 days and 30 days). Ensure that the security and privacy of the data are maintained in accordance with applicable laws/guidelines of various government authorities. States can set up their own dedicated Backend Control Centre, meeting the above listed mandatory provisions and any other optional features as they may decide. States can allow telecom service providers to offer Backend Control Centre as a Value Added Service (VAS) to the permit holders, meeting the above listed mandatory provisions and any other optional features as they may decide. In this case, the telecom service providers shall provide access to the Backend Control Centre to government officials, as decided by the respective state. 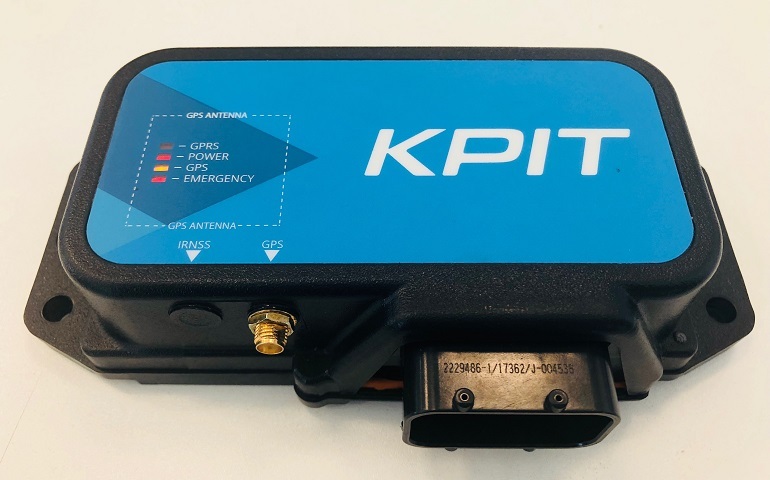 On February 14, 2018, KPIT Technologies has confirmed the availability of India’s first ARAI-certified AIS-140 compliant vehicle telematics and emergency button solution . In addition to the standard specifications, this product has provision to integrate market-first features like journey risk management for driver safety, CAN-based diagnostics for easy maintenance, and end of line diagnostic tools. According to company press release, the solution is based on KPIT’s cloud platform, through which transport operators will have an option to ensure higher operational efficiency through real-time tracking, route optimization, driver behavior monitoring, etc.